Interests:Designing Leather tools that make it easier & more fun to create art. Also, I absolutely LOVE teaching & sharing my years of experience with others. Here is the latest Christmas present I just finished. 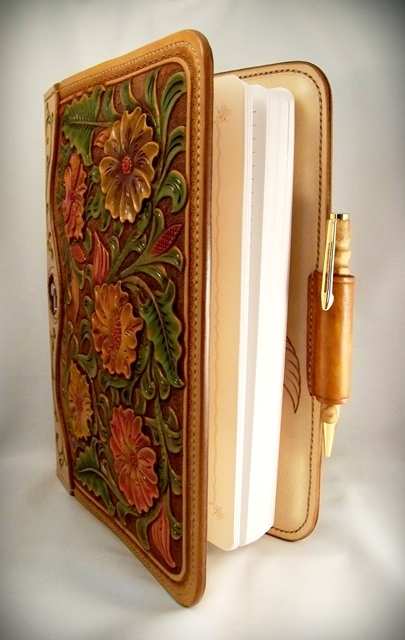 It's a Journal, for my Mother -in-Law, to continue writting her memoirs. This was one of those projects, that seemed to take forever to complete. Of course only being able to work on it for a couple hours at a time slows things down also. It measures about 10 1/2" x 8 1/2" x 1 1/4". It's a two piece cover, using 6/7 oz, with brushed pigskin as a lining, & 3/4 oz for the inside flaps. All the colors are with spirit dyes. The back also has some antique applied. It's all finished with a NeatLac type of finish. It's all stitched using 7spi,,, & the edges are done using Bob Parks method. Just before starting this project, I received a couple swivel knives & blades from Henley. They are well worth the wait, & the money! They came to me very sharp, & ready to use. I believe their blades are some of the best around! Thanks for looking!! Ed the"BearMan"
Looks nice! Henley blades and knifes are certainly nice and have a well deserved reputation. Leatherwork Specialty:horse, human and dog tack braided in kangaroo and paracord. 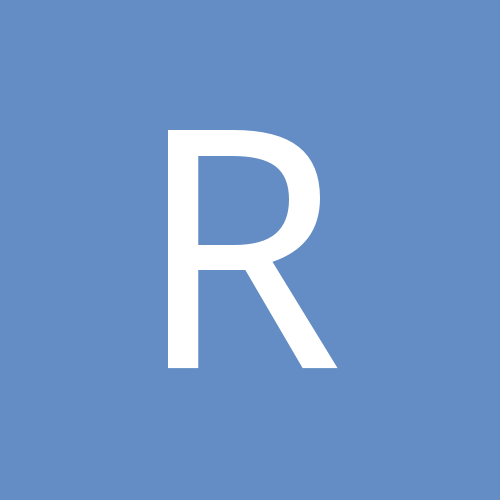 Interested in learning about:all forms of braiding, braiding with rawhide. 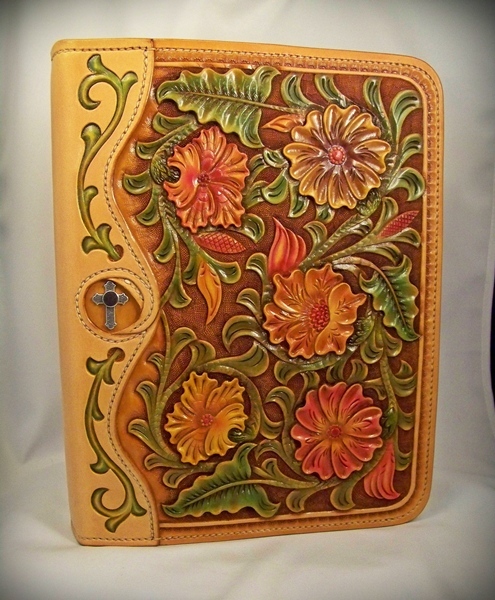 Interested in learning about:braiding, proper holster assembly, horse tack assembly. Interests:many and varied. from pen and ink drawing to digital concept art, motorcycles, and my family. 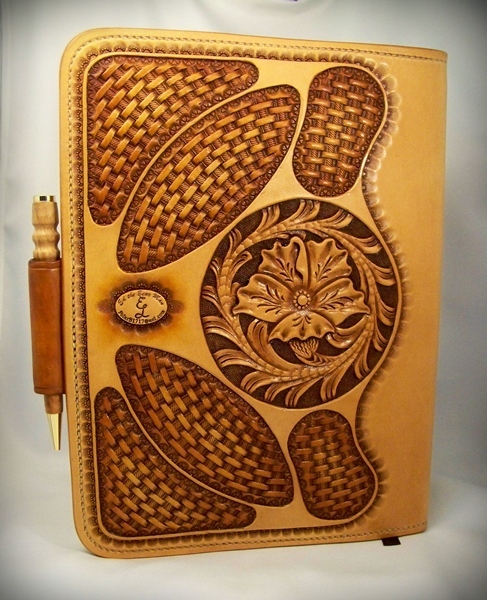 Interested in learning about:tooling leather. Interested in learning about:currently studying how handbags, backpacks, etc. are made. Ed, I really like this one. Sheridan isn't really my cup of tea but the colors really make this jump. The idea and execution of the back of the cover is great, has a very organic feeling to the basket weave openings, almost biological. Is the stitching by hand or machine? I have some covers to make for my nieces' and nephews' Quads (Mormon stack o' bibles & books in one) for Christmas and this gives me loads of inspiration. 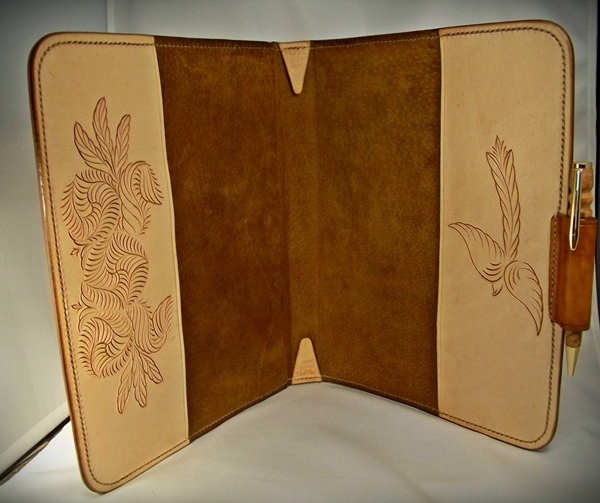 Interests:leather carving , Quarter horses, Westernriding. 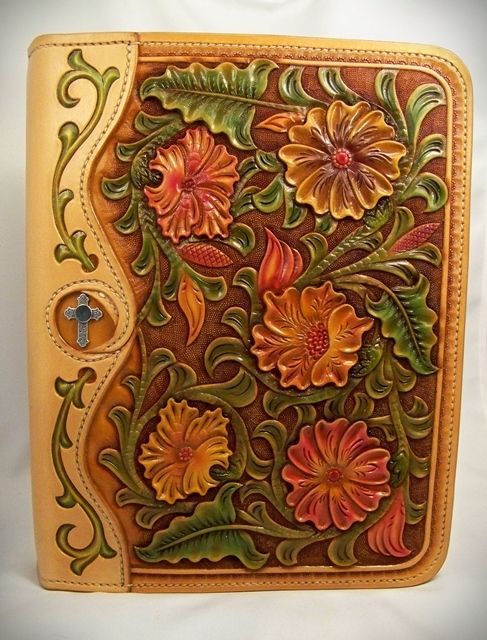 Leatherwork Specialty:Carving , making billfolds , dogcollars, little bags. What a beauty , great Christmas gift. Could I become one of your family members so I can be added to Xmas list. Chris, yes all the stitching is done by hand. The "organic" layout is really pretty easy to do,,, I usually just start with a mirror image, or a a copy of the overflap design from the front, & then build off of that. It's basically done with circles of different sizes. The "tricky" part is balancing the negative & positive spaces, to get close to the old "fibonocci" scale. Butch,,, sorry,,, I have too many on the "list" already!! You're right Bear, the balancing act is the hardest part and you really nailed it with this one. The lacing is some of the cleanest I have seen recently. Mind sharing what thread/supplier you used? I can get my channels and holes and such looking nice, I think the last bit I need to do is upgrade the thread I'm using to better quality. I consider your pieces as art, not just a craft. Have you ever considered putting together a tutorial on dyeing one of your pieces? Once again,,, thanks. The thread I used on this is an 18/4 natural color thread. As far as the maker,,, & where I got it,,, I think it's Barbour waxed linen. The reason I'm not sure, is that I found it squirled away, in a box I had forgotten about. Up until recently, I had been using a normal stitch groover, with mixed results. What I did differntly this time, is I used an old freehand groover along with a straight edge. I like to trim my edges down after all the stitching is done, so a normal groover just doesn't work as well for me. JayMack, Thanks!! Actually, I have talked with a couple places about doing a spirit dye coloring demonstration / class. Once I get things figured out,,, I'll try to let you know. Interested in learning about:I want to learn how to be a better carver/carftsman, and maybe some braiding. My eyes are bad and the puter is old and I don't/can't see as much as I'd like to. Look at the lower left corner of your window. You should see a small magnifiing glass with blue Plus symbol. Next to that it usually says 100%. By clicking the magnifing glass, it increases to 125% and then 150%. If you click on the small arrow to the left of the 100%, a variety of magnification scales are available. You can choose from the scale to increase or decrease the magnification. You can click on the pictures and then increase the scale from 100% up to 400%. I find that 150% or 200% provides a large enough image to see the details but not get to blurry. Love the finger work and the backcover.